Jandar's Oath - Collection 3 - "Heroes of Nostralund"
- SHOTGUN BLAST SPECIAL ATTACK: clear sight shot. 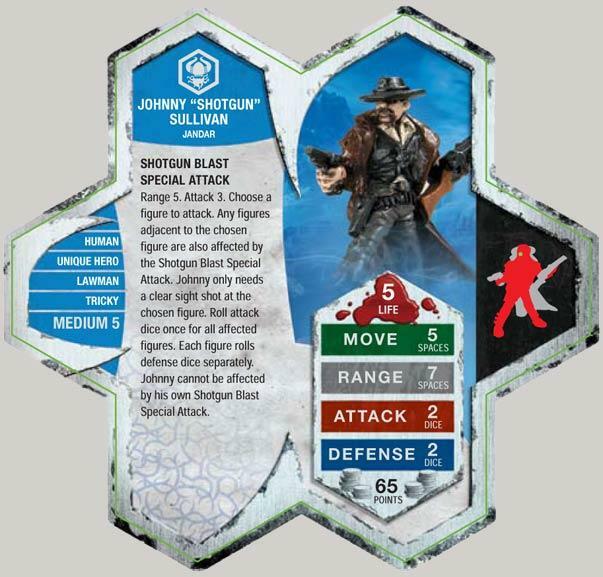 Johnny "Shotgun" Sullivan's Shotgun Blast Special Attack requires a "clear sight shot" to his target. Does the phrase "clear sight" indicate that Johnny "Shotgun" Sullivan needs only line of sight to any part of the figure rather than the hit zone? As a Human who follows Jandar, Johnny "Shotgun" Sullivan may aid Sir Orrick with his A BROTHER'S CALL movement bonus. As a Human who follows Jandar, Johnny "Shotgun" Sullivan may benefit from Capt. John Varan's PURPLE HEART wound reassignment. As a Unique Human, a destroyed Ebon Armor you control may be placed on Johnny "Shotgun" Sullivan's Army Card to replace Johnny "Shotgun" Sullivan upon his own destruction. Back on topic. I've only faced Johnny "Shotgun" Sullivan once. Let's just say, I didn't see much of that shotgun of his. Johnny was the only not valient unit so I had him leave the gate first and do as much as possible with his Shotgun Blast. I was pleasantly surprised when in the first and second battles "Shotgun" took out half my brother's army. Johnny was such a treat that my brother became preoccupied with him and I was able to get the 4th Mass to high ground protected by the Sentinels and Concan. In both battles I did not need to touch the Knights or Sir Gilbert. This team was in the finals for the tornament, but lost when I was forced to choose another one and play my brother as this team. I think it lost to a Samurai team. What is sweet about Johnny and J. Murphy in their basic stats are their decent-sized life points. Their defense is low, but pair them up with Raelin and that 5 life keeps the lawmen around for a good amount of time. They just need to make a cowboy squad with "lawmen bonding" and he'll, along with the other lawmen, be a lot more playable. For their price, the lawmen are nice component to an army. They don't necessarily need to be activated all the time or too early in the game. The explosion style shotgun blasts of Murphy and Sullivan make them a very big threat to clustered armies. Their threat is as real as DW9K's, but they're a heckuva lot cheaper*, will most likely stick around longer than the glassjawed DW, and can be carried by the mounts (of course their susceptible to all the small/medium size-based abilities of an opponent's units). A unit to bond with them might be a bit too much for their current price. *Well, if Raelin is needed to boost their defense, their price tags snuggle right up their with DW9K's cost. Utgar should get an Outlaw rather than a Lawman. Sullivan was my favourite cowboy based on the sculpts but i'd probably pick James Murphy anyday over this guy! Cleon, I happened to play my son and his cousin (both 7 years old) yesterday. Between them, they drafted all four lawmen and a slew of other units for a grand total of 600 points. I took 660 points worth of Zombies. I've been 'refreshed' on Sullivan an Murphy and figured I'd respond when I saw this thread. Your bonding comment made think they're fine without if they can get some of that Raelin aura goodiness. I've not been a fan of Sullivan, but yesterday swayed me to try him a bit more. Murphy? I'm hooked on him already. Cool! Wow your zombies got taken out by the cowboys (lawmen) even though you had more points worth of an army. I guess I was wrong about the lawmen. They are good without the bonding! I see your point in this case. Well....I fail to mention I let the kids roll the d20 towards the end of the game. If they got 11-20, they were able to bring in Jotun for reinforcements. The rolled 18. And I tell you, I've never seen such jubilant, excited 7-year olds in all my life. I knew I was handing them my possible victory, but just to see their eyes light up when they knew they were getting Jotun. A defining moment for me, Heroscape, and children. I wish I could've videotape their yells and jumping up and downs!!! My friends and I especially like these relatively cheap heroes for fighting against the zombies, if for no reason other than who wouldn't want to see someone hold off a zombie horde with a shotgun? They work well against low movement melee units on tough terrain, but on level ground will probably fall. I've seen Sullivan used a lot before Murphy came out and between the two of them, their use is about split since that time. (depends on if someone's got the 10 extra to spend on Murph). Sullivan is greatly useful and is a cheap counter to armies that have a defense againt normal attacks. If you've got no other special attacks in your army, you must draft Sullivan or Murph IMO. DUND is underestimated and under-rated. I'm bumping this thread. Used all 4 cowboys in the Battle at the Border tournament today and Shotgun cleaned house!